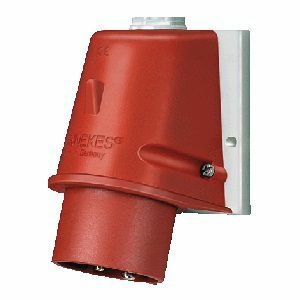 Mennekes Wall Mounted Inlet 804 32Amps 5p 400v IP44 | DamenCNC B.V.
We often use this wall mounted inlet on devices. It is a very good quality German made product. One of the reasons we mount it on devices, is that you never know what cable length the client needs. When you supply a device with a cable, the client will often open the device, to lengthen the cable. This is a situation we dont want, since they could damage the device by incorrect connections. 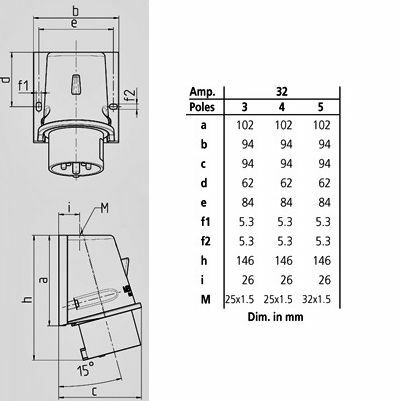 When using this wall mounted inlet, and mounting it on the device. The client can use a contra plug and then make any cable length they want.